Hey Dave – I don’t see why not as the principal is the same – especially as Fusion-io drives are server-side rather than attached through some network fabric. I’d love to hear of your results if you get time to do any testing! Very interesting results Paul! Thanks for taking the time to put this together and share your findings with us. Would like to see this with increasing number of DBs. i.e. if you have 24 DBs all on a single FIO card what is the impact compared to running one. Your update is very timely as we are about to purchase Fusion-IO cards to offload tempdb storage from our SAN. I was debating the benefit using a larger sector size and your benchmark numbers help very much. Hi again Paul. I’ll definitely post the results of the RamDisk comparison. We did have some eval FusionIO’s recently, but have since given them back (bugger!). But we do have a nice new EMC V-Max SAN with plenty of solid state & FC disk, so I’m going to do some comparisons between that (solid state & FC) and the RamDisk. I was wondering if you could give me a little more info on your test rig? For example, are you using some kind of load tool to spin up the 64 connections? Sorry if you’ve given this detail somewhere else; I searched but couldnt find it. Thanks. Hey Paul, do you think you could have improved performance if SQL Server had a flash cache capability, similar to Oracle? Also, this test seems to have been fully cached (?) would your answer change if the test DB were much larger than the cache? Merrill, filling up a flash based SSD in a high i/o scenario basically equates to mis-use of the device. Data cannot be over-written in place in flash memory & hence is relocated somewhere else upon every write (at block scope). If you fill up the device, there’s nowhere for this relocation to occur & writes then have to wait on previously used blocks to be "flashed" (zero’d, ready for new writes), hence "over-provisioning" is required with flash based SSDs. 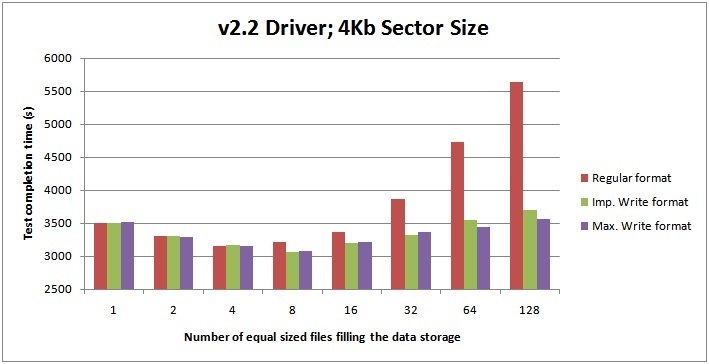 The higher your i/o rate, the more you have to "over provision" (smaller File System allocation vs device capacity, or in other words, the device is "over provisioned" against the FS allocation). We provision SSDs by default for SQL Server with 25% over-provision (FS = 75% of device capacity) and sometimes go lower (eg 50%) in extreme i/o scenarios. As a result, we’ve never seen device degradation after years of use in high volume sites. If you didn’t over-provision however, you could expect the degradation you’ve described but this just means the device wasn’t correctly specified. Texas Memory says give them a shout and they might be able to hook you up with some of their similar PCI-E cards (if available). Seems like the comparison could be really interesting. This matches my experiences. As you grow into the very high scale, you end up with #data files = #cores. I happen to have a 64 core box around with some FusionIO. If you could mail me the exact test harness you run (just 64 x SQLCMD? ), I will try to run your tests on the bigger box. Another insight Paul: The reason you see lower latency on PAGEIOLATCH at 128 could be caused by the characteristics of the Fusion cards. A wide I/O pattern with few outstanding IOPS on each thread is more efficent on NAND than a narrow pattern with many outstanding on each thread. @Thomas Cool – that it matches your high-scale experience. And will drop you a mail. @Greg Test wasn’t fully cached as the box only has 16GB and I was inserting 37GB of new data with a random GUID key. Perf would have been better with more memory (i.e. more cache) for sure. @Paul: by the way, if my theory about the low latency in 128 file scenario is true, you should see lower disk queue lengths per thread during that run. For my test, I will just run with the latest FusionIO driver on a write optimized drive. I think you have proven the point about drivers and write optimization well enough already. With regards to the SOS_SCHEDULER_YIELD waits, what does your CPU look like during the 128 file run? @Thomas Just re-ran the 128 file tests – all 8 non-HT cores sitting at 70-80% usage. Would love to see this updated with 2012 R2 and SQL 2014 SP1. Shouldn’t be any significant difference. Given this and your test table here has clustered index on MyBigTable(c1), why are we seeing PFS page contention? Can you please help me understand? Thanks! As always , You are Superb !!!! !